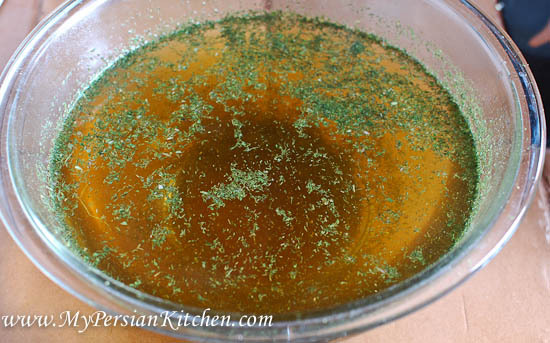 I have a theme going on this March with posting traditional Iranian recipes for Norouz that provide shortcuts in order to reduce the amount of preparation time. 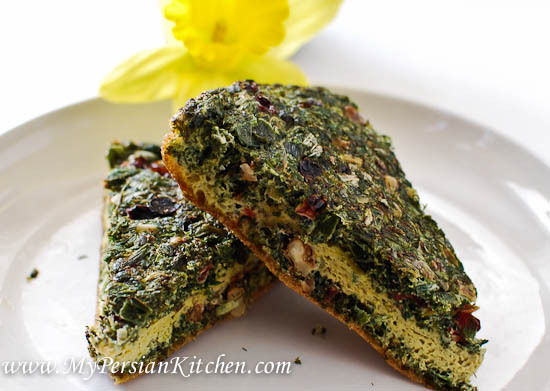 Today’s recipe is the beloved Sabzi Kuku which is made with prepackaged herbs. I am very fortunate that I live in Los Angeles where there are plenty of Iranian stores where fresh herbs are available year round. My personal preference has always been to use fresh herbs for recipes. A close second is frozen herbs. My very last choice is dried herbs. Finding fresh herbs or having frozen ones are not always an option. But having prepackaged herbs in your cupboard it certainly is. This is most definitely a commodity at a bargain price. The content of the box comes to about 2 and half cups of dried herbs. The package above came from my local Persian store at $2.99. The combination of herbs included is leek, dill, parsley, and fenugreek. My own Kuku Sabzi recipe is made with parley, cilantro, dill, and chives, so the box’s combination of flavor is certainly different than my own personal recipe. The biggest difference in taste though comes from fenugreek which is a very strongly flavored herb. In fact, many people do not like the smell of taste of it. So this might not be a tasty recipe for everyone. Place dried herbs in a sieve then place in a bowl. Pour 3 cups of warm water and allow to sit for about 10 to 15 minutes. 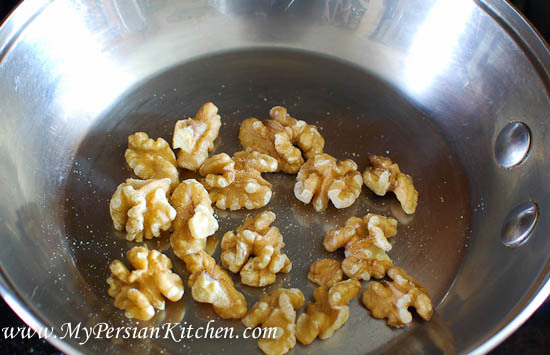 In the mean time toast walnuts, then rough chop. Remove sieve from bowl. You will notice that a lot of the dill stays behind in the water. 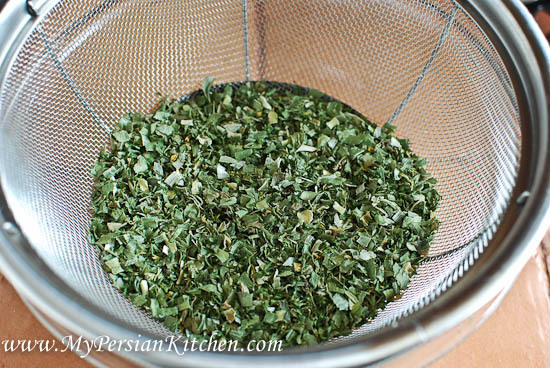 Pour water over the herbs in the sieve and allow to drain well. 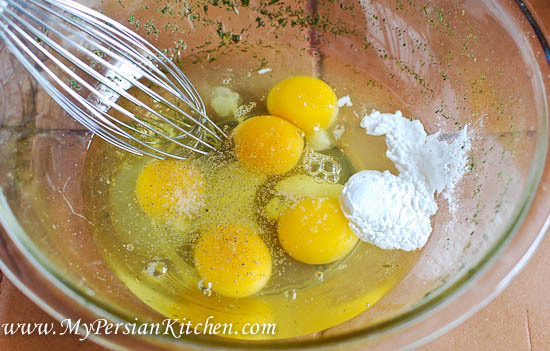 In the same bowl beat together eggs, baking powder, salt and pepper. 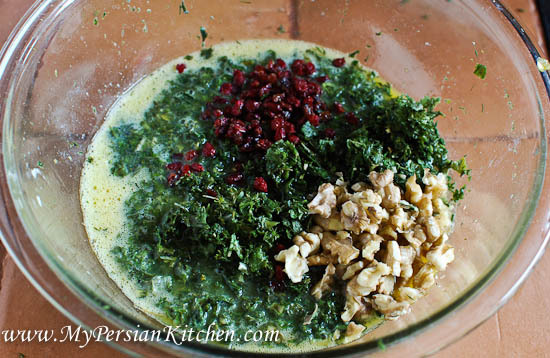 Add herbs, walnuts and rinsed zereshk, then mix well together. In a non-stick pan warm about 1 tablespoon of olive oil. Then add the egg mixture. Cook covered for about 15 minutes until firm, then flip over and cook for another 5 minutes. 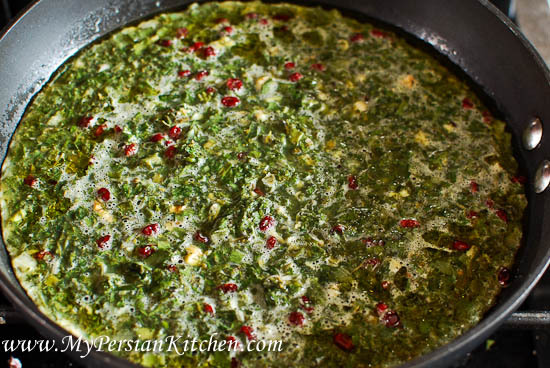 yum, kuku sabzi is my favorite dish for this time of year. aidet mobarak! What is zereshk? I live in the UK. I should be able to get it here. They have these wonderful big continental supermarkets that sell many wonderful spices etc. I am half Iranian/half American. Dorood and thanks for a great site full of useful information. Great to mention this recipe for these days as I remember my family always made kookoo for the new year table. (by the way, a bit of garlic goes a long way to improve things), together with smoked fish and sabzi polo. 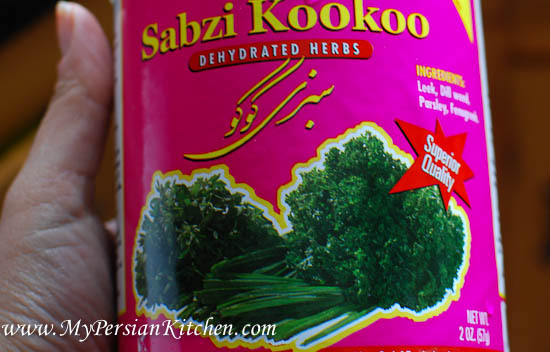 Another variation of this is to reduce the amount of sabzi you use, and replace with finely chopped lettuce. This makes it a lot lighter. Thanks again and Happy New Year to all. Hi Lisa, Zereshk is barberry. What do you do with the dill that stays behind? Shari, I often freeze them for later use.